When I looked for an animation shot in 2001, it seems to have been already deleted. 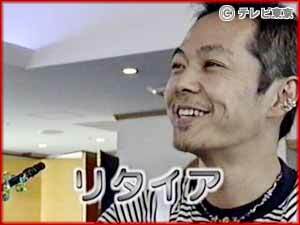 It was shot on "Beads Art king championship" of the TV program, and could be seen in YouTube a few years ago. Those days, on TV, powerful woodworking with electric saw or speed eating made so strong stream, that the small and neatly arranged contents went out. The production company and the emcee asked me to be the judge from second "championship" , but it didn't come true after all :-). But the "TV Championship" seemed to be televised plenty in Asia. In GREY the rental gallery I rented　one week every month, tourists from Hongkong and Taiwan asked me handshakes and photographs.It was surprising.